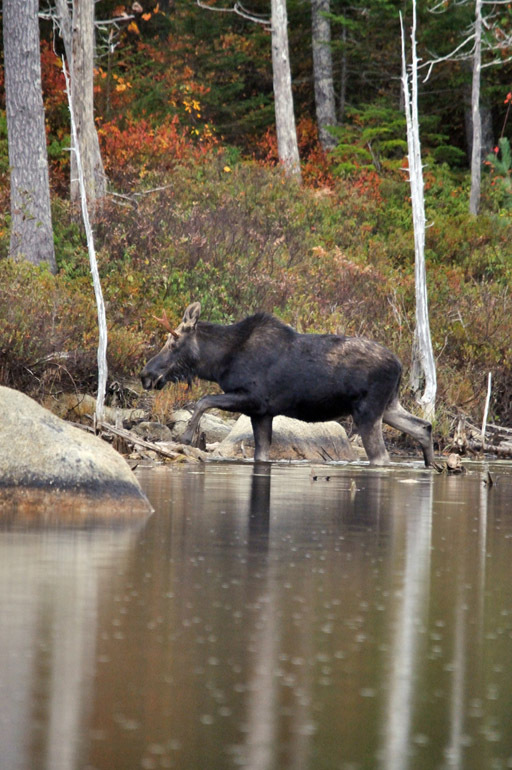 Moose are so used to people at Baxter State Park that they frequently make close passes that normally wouldn't be seen in the wild. If this had happened outside the park, I'm sure someone with a rifle would have ended it, especially considering it was moose season. This is probably my favorite shot of the day. 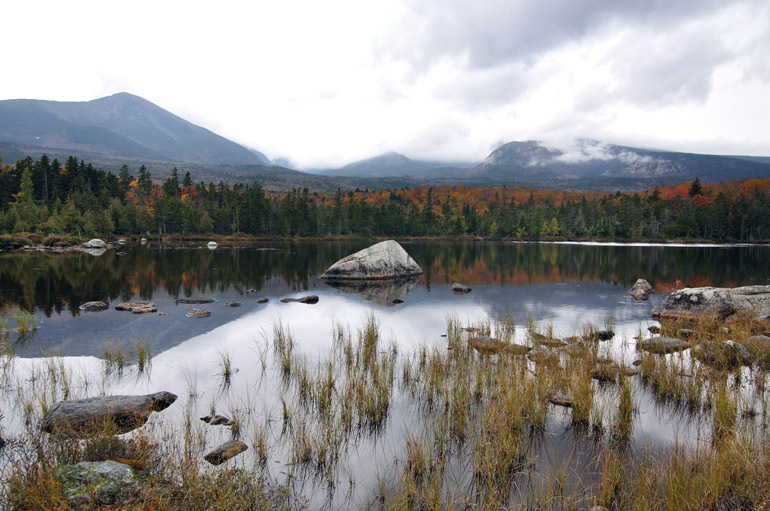 Day 5, a Friday, of my Maine vacation was a solo trip two and a half hours north of Princeton to Baxter State Park, home of Mount Katahdin and lots of moose. Driving on U.S. 1, I got distracted, though, and shot the sun poking through the clouds just after sunrise. Unfortunately, it was the most sun I would see all day. 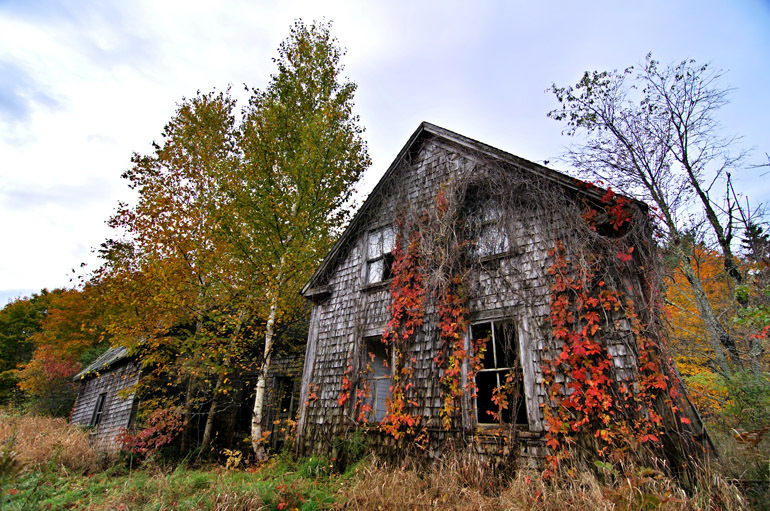 This old, ratty house caught my eye along Route 6, an east-west highway that winds through the hilly, rural terrain of western Washington County and eastern Penobscot County. 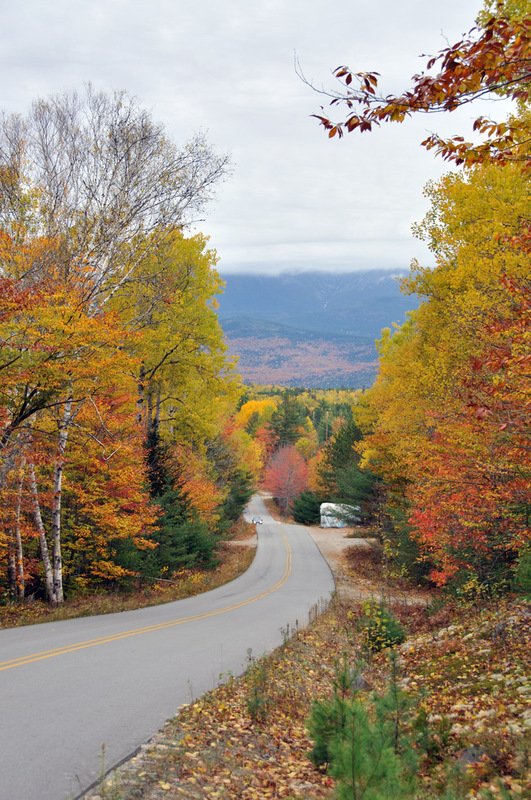 Just north of Millinocket, the closest town to Mount Katahdin, I took this exposure of the road leading to the park and of the foliage surrounding it. 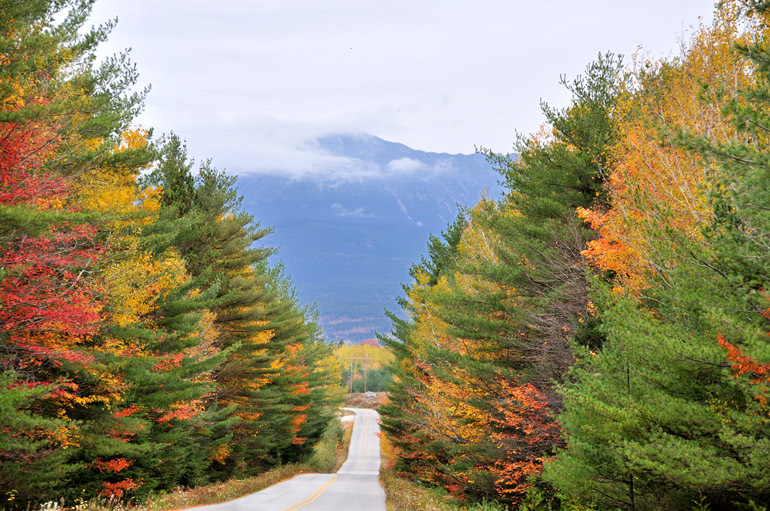 Golden Road offered come gorgeous views of the cloud-shrouded Mount Katahdin, which rises about a mile above sea level. As I got closer to the park, the clouds grew thicker, completely hindering the top of the mountain from view. The conditions weren't good for a climb in the first place, but because I had left my parents' house later than expected, I wouldn't have had time to make a leisurely hike anyway. But I've already climbed the mountain several times, so it wasn't a priority. 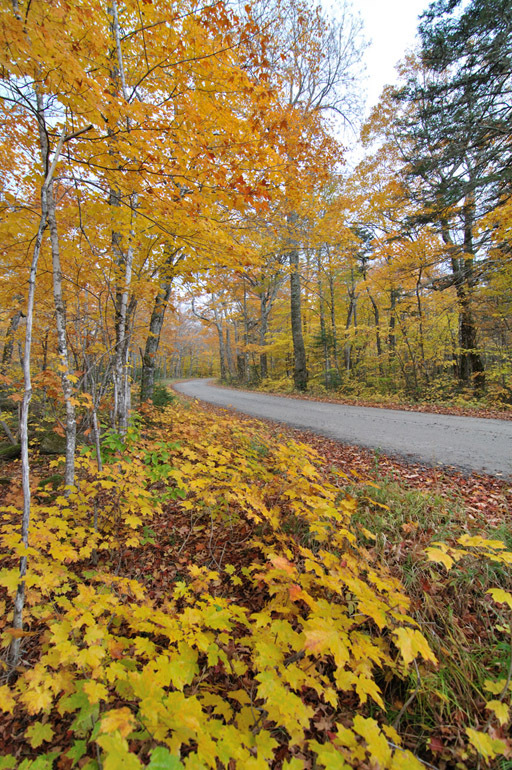 Before the tar road turned to dirt, I took some shots of the trees overhanging the route. 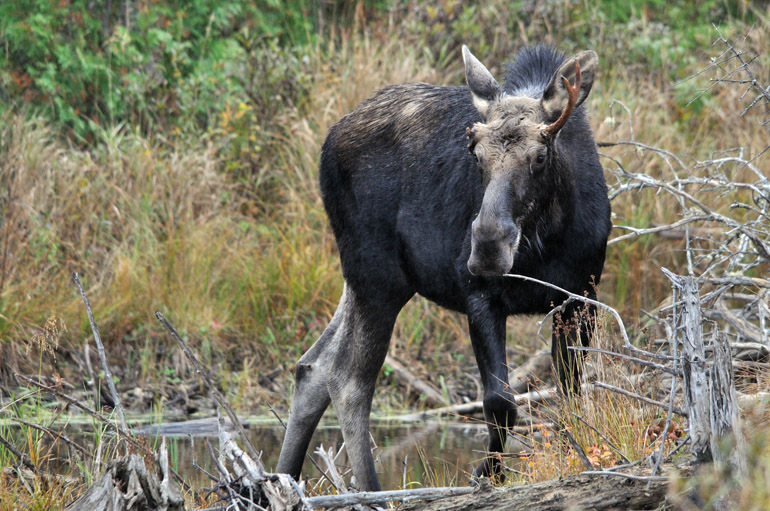 Now deep into the park, I hiked about a mile to Sandy Stream Pond, one of the most popular places in the state for viewing moose. 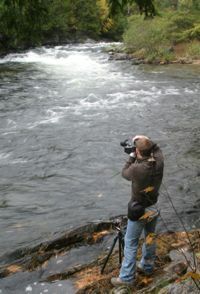 The clean body of water draws photographic tourists from throughout the nation, including some I met from Wyoming and New York City. 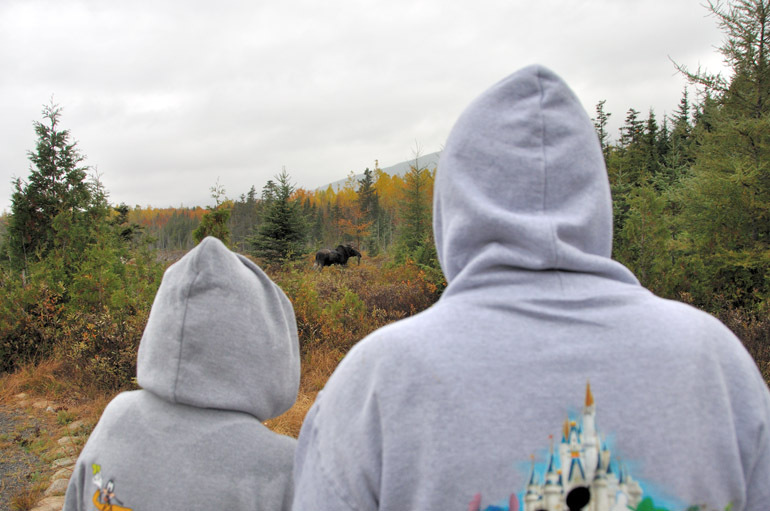 This group had seen a moose earlier in the morning and was waiting for the animals to make a repeat appearance. Like me, however, they were not happy with the overcast, low-hanging sky, which made for very poor lighting conditions. 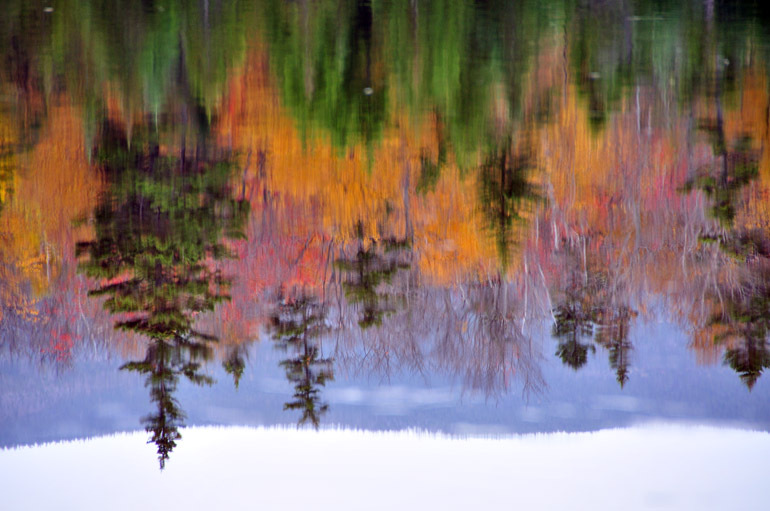 The reflections on the surface of Sandy Stream Pond look more like a painting, an effect caused by a slight ripple on the surface. It was raining when I arrived at the pond, but it stopped shortly after, allowing for a more placid look to the surface. My family always has said that you can't be a true Mainer until you've climbed Mount Katahdin and become a regular drinker of Moxie, the official soft drink of the state. I say you can't be a Mainer until you've done both of those things at the same time, a feat I've achieved a countless number of times. For this trip, I settled for sipping the bitter cola from the shore of Sandy Stream Pond. 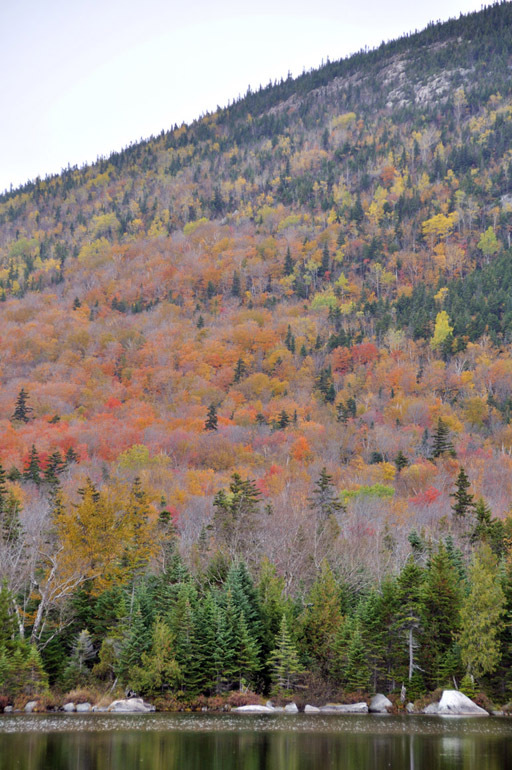 The foliage was considered to be at its peak level on the hills and mountains of north-central Maine. 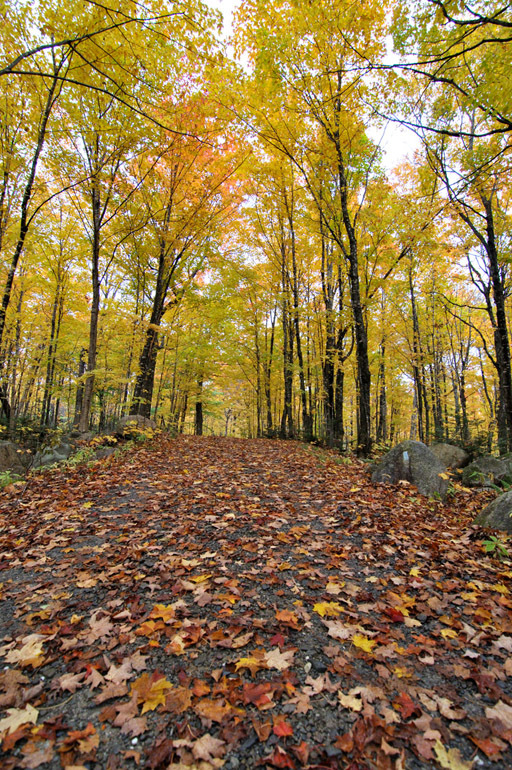 But because of rain and wind storms, much of the leaves had fallen from the trees. The weather just wasn't cooperating during this vacation. 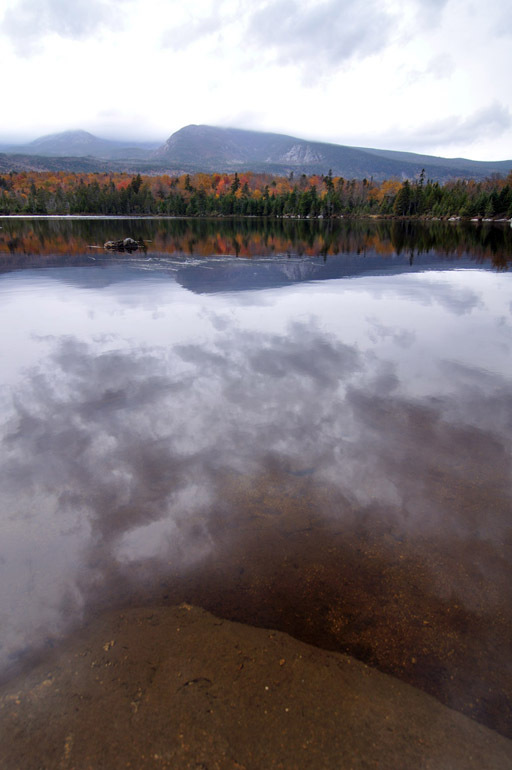 Clouds hang low over a still Sandy Stream Pond. Another shot of the pond. 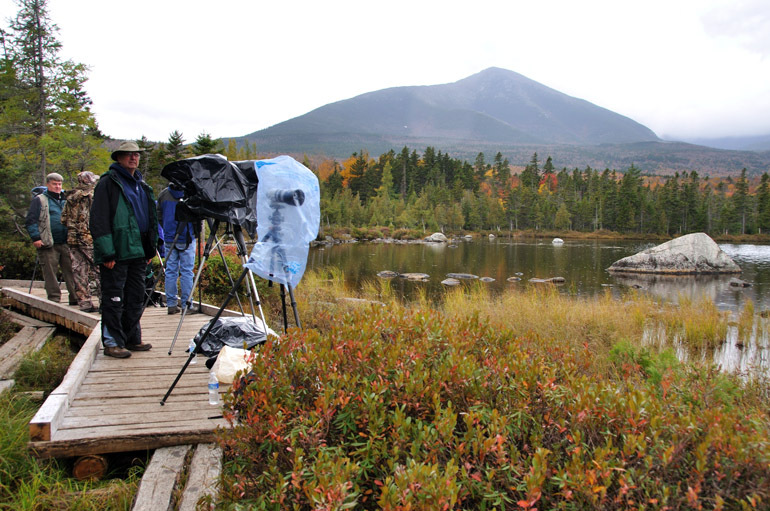 An amateur photographer from New York City takes exposures of the low-level cloud cover over Mount Katahdin. 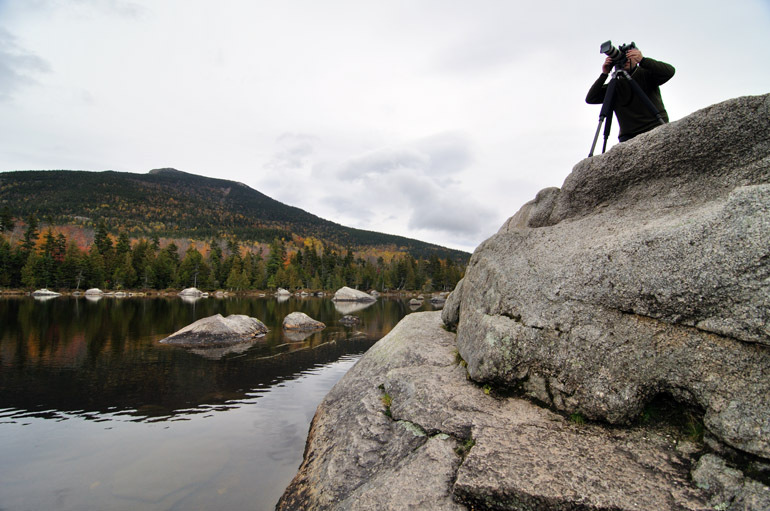 He was using a tool I do not have - a neutral-density filter, or grad filter - to capture details of both the bright clouds and the much darker cliff face of Mount Katahdin. 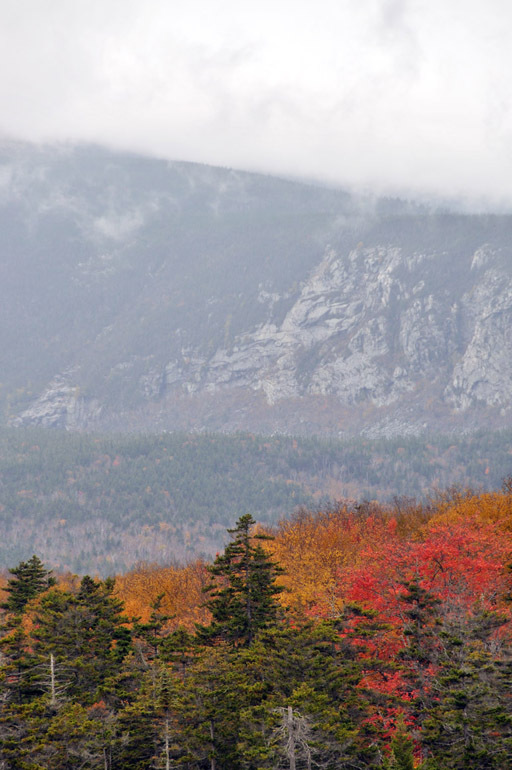 The peak featured here is not Mount Katahdin, just a smaller mountain near the end of the Appalachian chain. 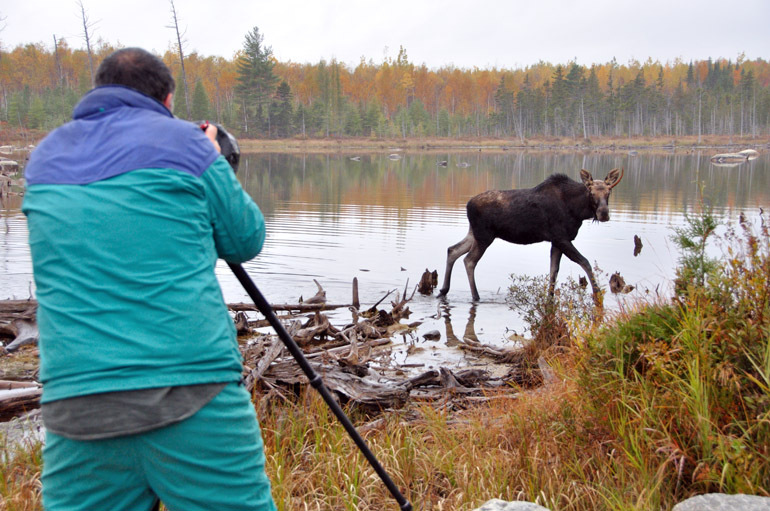 The moose that the photographers were waiting for never moseyed out of the woods during my short stay at Sandy Stream Pond. It was late morning when I left, but moose usually come out to feed earlier and later in the day. 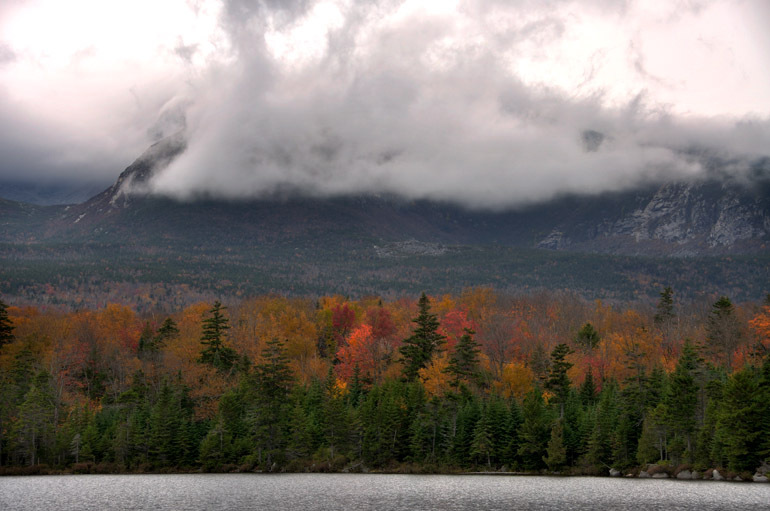 An HDR image, a composite of three separate photos, shows some detail in the clouds shrouding the mountain and the fall foliage below. 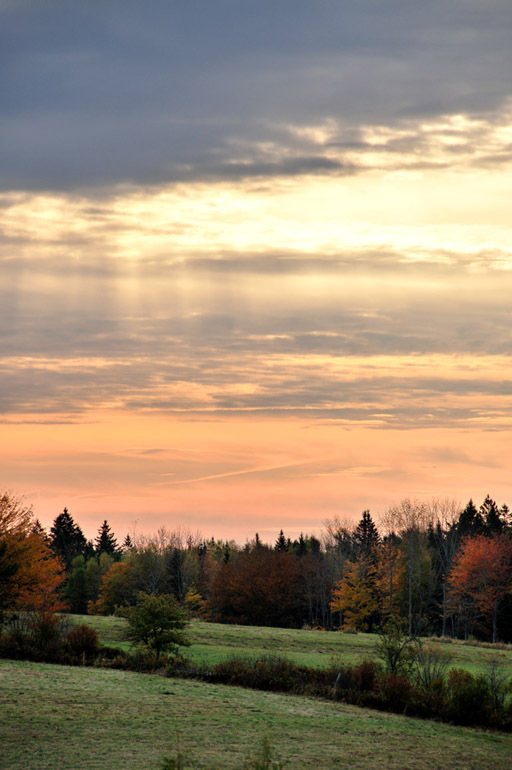 I created this in Photoshop, though, which isn't the best editing program for creating HDR pieces. 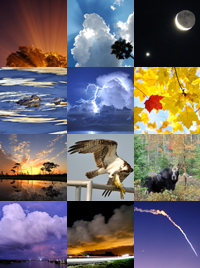 Click on the above image for a full-size panorama. 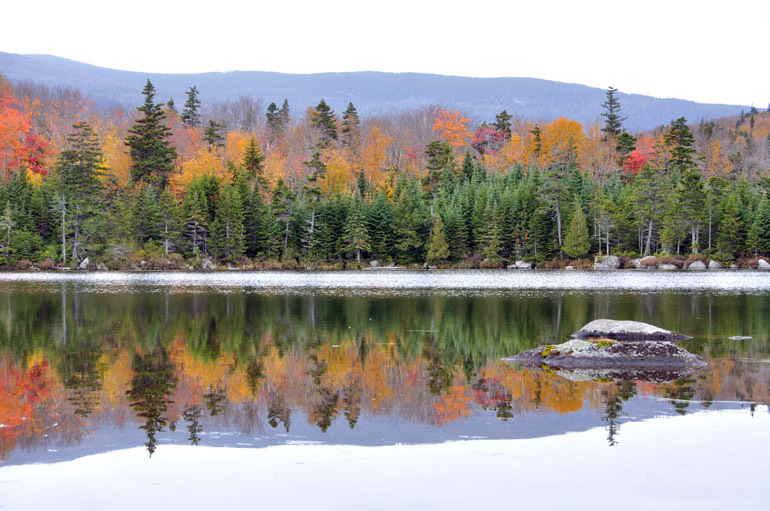 The is a panoramic stitch of nine separate images taken at Sandy Stream Pond. 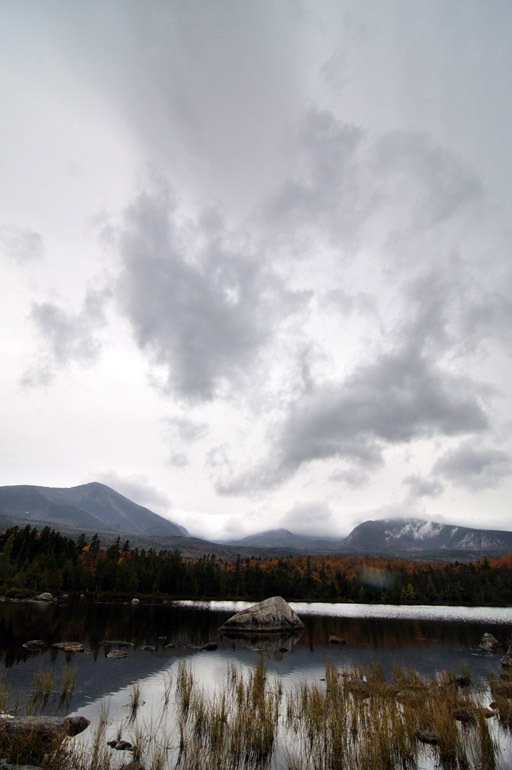 Mount Katahdin is not visible because of clouds, but this at least shows some of the smaller summits in the area. At this point, the photos at the pond started to get repetitive, and I moved on, just as it started to rain again. I hiked the mile back to the campsite, with my 50 pounds of equipment in tow. A scene somewhere along one of the narrow, winding park roads. 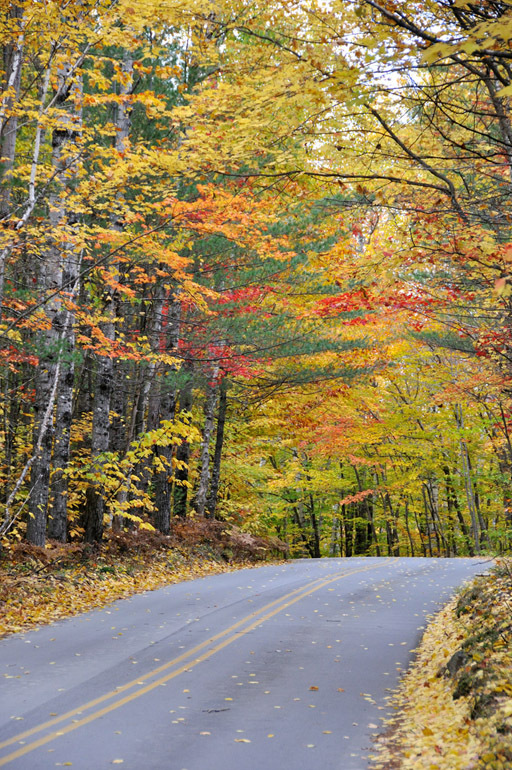 The yellow leaves along the road caught my eye, then this stream added to the beauty of the scene. 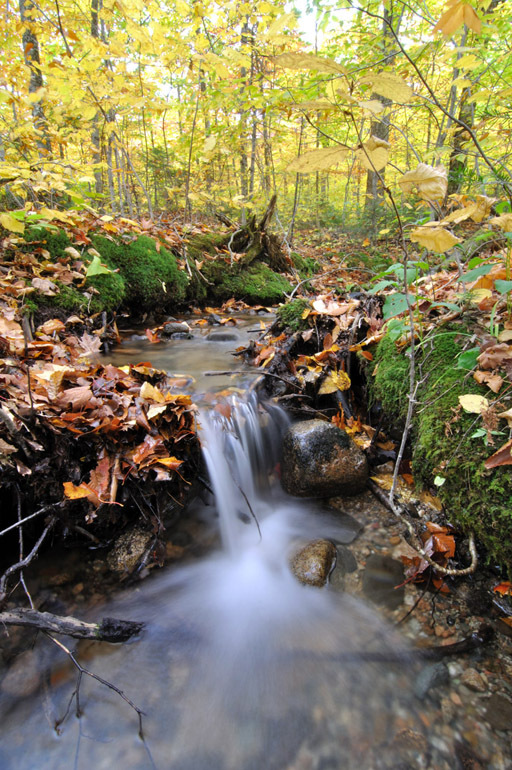 This is a three-second exposure, which achieves that smooth, blurry effect in the falling water. 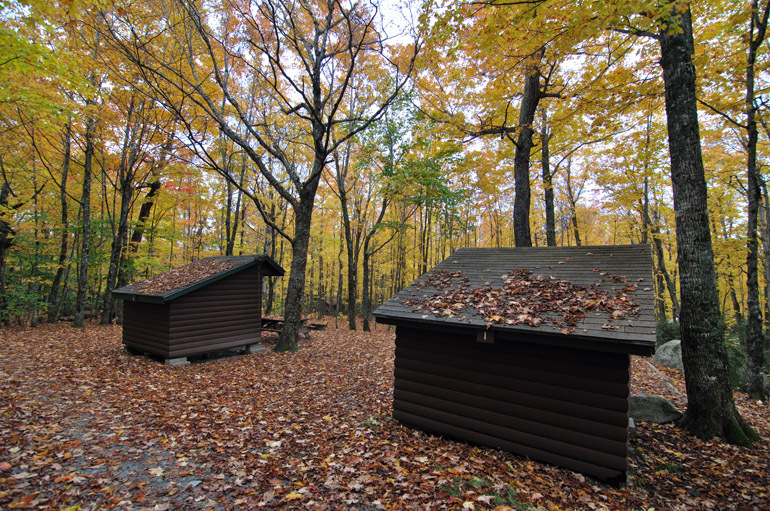 On the road in the western portion of the park, these wooden lean-tos occupy space at the Abol campground site. 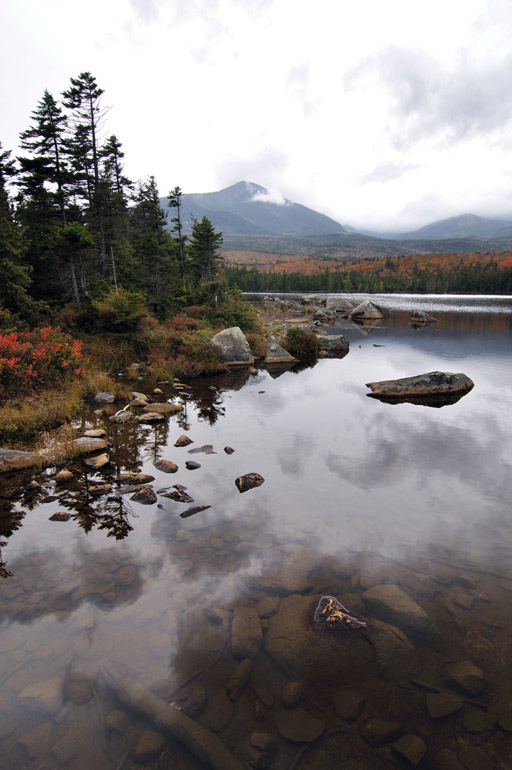 Abol is one of the most popular trails to the top of Mount Katahdin, which marks the end of the Appalachian Trail. The rain came fast and hard at this point, so I quickly took a shot and left, with intentions to begin the journey back to my parents' house in Princeton. On the way out of the park, I noticed some people stopping in their cars and pointing across Stump Pond, a small body of water speckled with the trunks of dead trees. 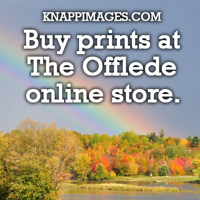 By chance, I saw that a former Bangor Daily News co-worker was one of those gawkers. She told me about the bull moose that came out out to feed. Despite the rain, I pulled out my camera and my 500mm zoom lens. 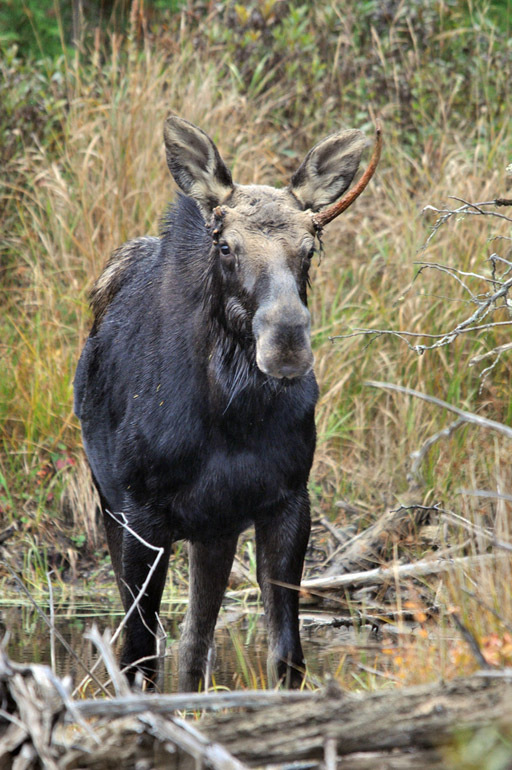 The moose roamed through the woods and came out in an area that was easily accessible by foot. So I got closer and noticed that the animal had gotten into some sort of tangle, likely with another bull over some fat cow. It was missing one antler and appeared to have an eye issue. 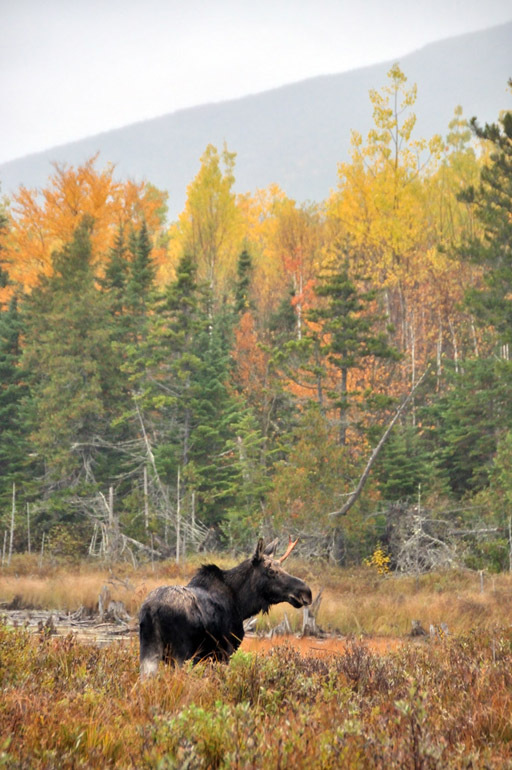 This guy was fairly young, but because of their general size, any bull moose would feed a hungry Maine family for a year. 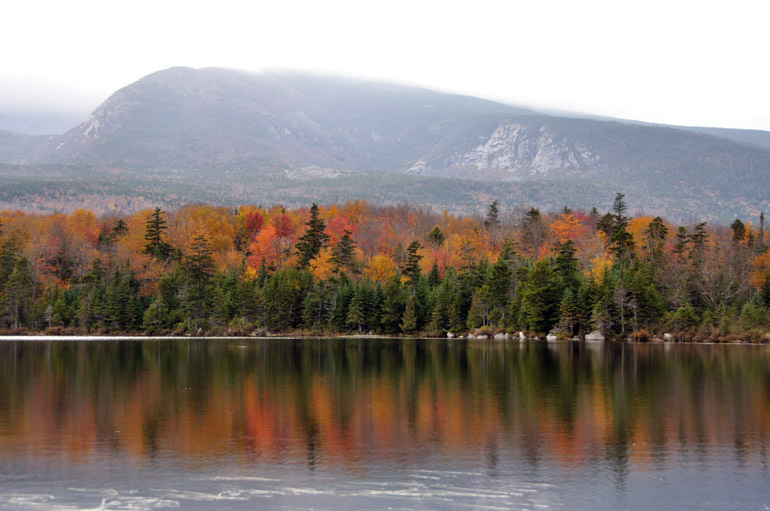 Unfortunately, hunting isn't allowed in Baxter State Park. 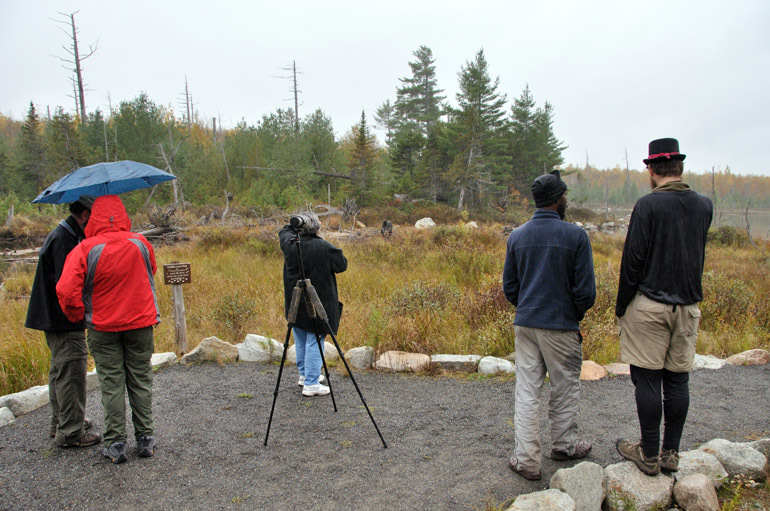 These are some members of the crowd that gathered to watch the moose chew on the grass growing in the pond. Some tourists who appeared to have last visited Walt Disney World in Lake Buena Vista, Fla., got in on the action. 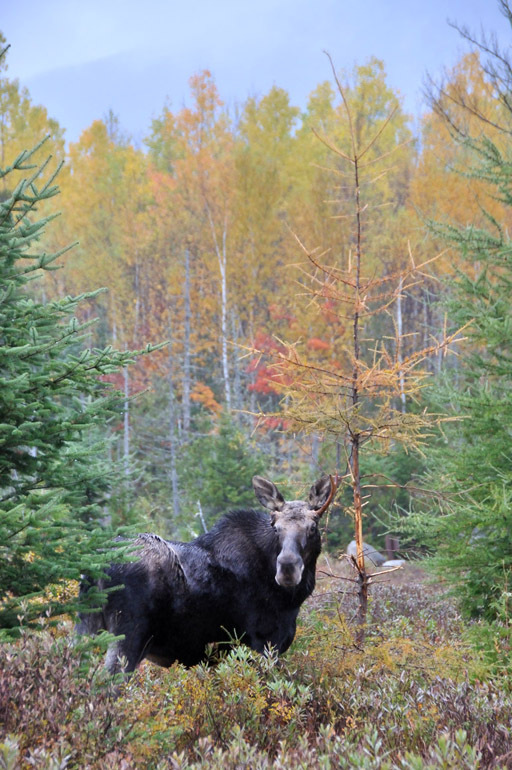 The moose came ashore and marked its territory on a dying evergreen. The slope of the north side of the mountain is visible in the background of this photo, the last of the day, as my camera was quite soaked.